Glassy-eyed antique dolls huddle in a Gothic parlor like dead children holding court at a mad tea party. Marionettes with too-wide eyes wave their withered arms as animal armies created by a mad taxidermist fight eternal wars beneath a veil of dust. These are just some of the wonders Catherine encounters when she’s sent to appraise the holdings of Red House for auction. The offerings are priceless, but less so than her soul, which like her sanity is really on the table as the ghosts of the past place bids on her life. Catherine is every bit as haunted as the mansion, plagued by memories of a series of unsolved child abductions that left her with a chilling imaginary friend who may hold the key to escaping Red House. With every page the dread builds, the atmosphere weighs like lead, and the climax will grip your heart in an icy, porcelain hand. - R.J. Crowther Jr.
Catherine's last job ended badly. Corporate bullying at a top TV network saw her fired and forced to leave London, but she was determined to get her life back. A new job and a few therapists later, things look much brighter. Especially when a challenging new project presents itself — to catalogue the late M. H. Mason's wildly eccentric cache of antique dolls and puppets. Rarest of all, she'll get to examine his elaborate displays of posed, costumed and preserved animals, depicting bloody scenes from the Great War. Catherine can't believe her luck when Mason's elderly niece invites her to stay at Red House itself, where she maintains the collection until his niece exposes her to the dark message behind her uncle's "Art." Catherine tries to concentrate on the job, but Mason's damaged visions begin to raise dark shadows from her own past. Shadows she'd hoped therapy had finally erased. 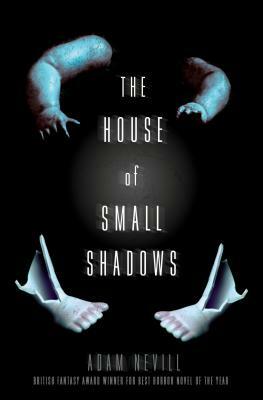 Soon the barriers between reality, sanity and memory start to merge and some truths seem too terrible to be real... in The House of Small Shadows by Adam Nevill.